Will Serif's latest photo editor take on Adobe and Corel? Serif produces a wide range of image editing and creative design software. However, it tends to be aimed at the entry-level and home user rather than the high-end professional studio. Serif PhotoPlus X3 is the latest version of its popular editing suite and comes with an improved interface and a number of advanced editing features. The new interface still follows the standard layout of any editing suite, with a large editing area in the middle of the screen, with options to line your favourite tools down the sides. First-time users will appreciate the inclusion of a host of new how-to guides, which help you get to grips with the layout. In reality, the interface fails to match the more intuitive navigation of Adobe's Photoshop Elements. At the heart of the new suite is QuickFix Studio, which allows you to make a host of changes, from adjusting white balance, to red-eye and blemish removal, as well as sharpening and noise reduction tools. We found it incredibly easy to use, achieving simple but effective results within minutes. What's more, the Before and After guides help you instantly see the changes you're about to make. Of the new features in PhotoPlus, perhaps the most significant is RAW Studio, which allows more experienced users to handle and edit large RAW files, rather than just JPEG files. Similar to Adobe's Camera Raw feature, you'll be able to manage white balance and noise levels far more effectively than is possible with JPEGs. Then there is support for Microsoft HD Photo files, which offer you a better high-quality finish than a standard JPEG image, while taking up less space. This will be popular with anyone looking to upload their edited images online. 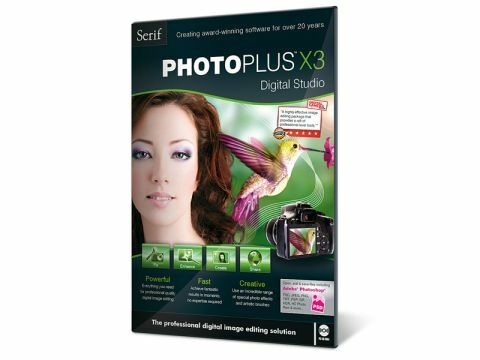 The upgrades made in Serif PhotoPlus X3 are logical and help the suite keep pace with its rivals. The new interface is an improvement, but there are more intuitive options available. This isn't a suite you would switch to, but if you're new to image editing, it's a good place to start.